Polar bears are very dependent upon the ice for their very survival. Indeed, it is their natural habitat. The ice, and its continued existence, is crucial to the survival of the polar bear as a species. Without sea ice, the polar bear is in danger of extinction. Polar bears live in the Arctic in an area known as the circumpolar north, or the North Pole. Their bodies are built to withstand temperature extremes, but they need to keep their bodies and coats in good condition to do so. They live on land, but they hunt in the sea and are strong swimmers. They are migratory animals, and use ice floes to rest between large expanses of sea ice where they do most of their hunting and mating. The polar bear's main diet staple is ringed and bearded seals, which have high concentrations of fat. This fat is necessary for the polar bears to retain their weight and girth so they can survive famine and pregnancy. 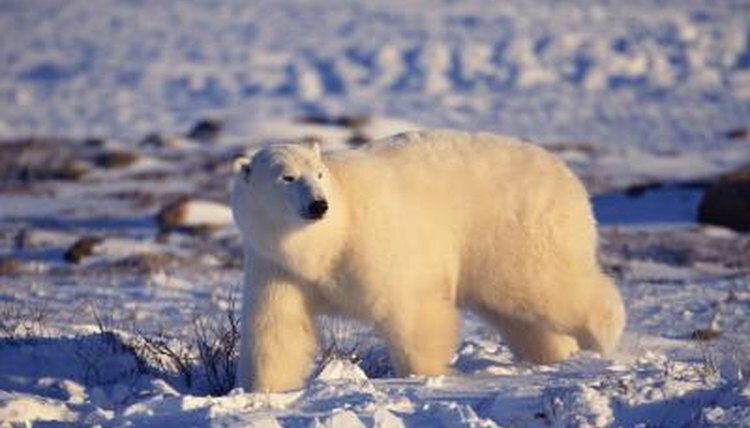 Threats to the ice mean threats to the polar bear and other marine animals that benefit from the polar bear's epicurean habits. For example, without polar bears, the seal population won't be naturally managed, resulting in an overpopulation of seals. Furthermore, the polar bear usually only eats the seal's blubber, leaving the rest of the animal for scavengers such as foxes. The Arctic sea ice is the natural habitat of polar bears. They live on the ice where they hunt, mate and even build dens in which to raise their young. The sea ice is more than a solid mass, it's comprised of organisms on which seals and other marine animals feed. Therefore, the ice supports a large number of other animals in addition to the polar bear. Polar bears depend on large masses of thick ice floes in the waters farther out to sea; they offer a place to rest during hunting and migrations. Polar bears are adapted to life on the ice. As their habitat decreases, so does their chance of survival. One of the biggest threats to polar bears is the decline in mass and thickness of the sea ice due to climate change. According to the U.S. Fish and Wildlife Service, there has been a "rapid and unprecedented retreat of Arctic sea ice (including earlier spring melt, later fall freeze-up and overall thinner ice) and there are projections of an ice-free Arctic Ocean within the foreseeable future." When the sea ice disappears, the polar bear will either have to adapt or die out as a species. The World Wildlife Fund reports that bears are coming ashore much lighter than in previous decades, and the death rate for cubs is climbing because mothers cannot sustain the weight needed to produce enough nourishment for them. Underweight polar bears cannot maintain the biological processes to live, suggesting that adaptation is not a viable outcome. Conservation efforts are underway to protect the polar bears and their habitat. Although it is difficult to get an exact count, the U.S. Fish and Wildlife Service estimates there are approximately 20,000 to 25,000 left in the wild. In 2008, the United States listed the polar bear as threatened under the Endangered Species Act. Canada and Russia have added the polar bear to their respective lists of Species of Special Concern. Additionally, there is a polar bear "maternity ward," an area with ancient and viable reusable dens that support an estimated 500 new births annually located in the Russian Arctic. However, it is the threat of climate change, specifically the warming of the Arctic, that is the biggest challenge to the survival of the species. Unless drastic measures are taken to address this phenomenon, the polar bear may not survive the next century. What Does a Polar Bear Look Like & Where Does it Live?